Also indexed as:Euterpe oleracea Mart. Are Antioxidants the “Fountain of Youth”? Clusters of round, dark purple-to-black, berry-shaped açaí fruits are harvested to make juice, ice pops, and herbal supplements. Ethnobotanists have also documented folk medicine uses for the seed oil, fruit rind, and roots. The inner core of the thin trunk of the açaí tree is well-known as the source of hearts of palm. Açaí is primarily grown in the Pará region of the Amazon estuary, in the northern region of Brazil. It also grows in French Guyana, Panama, Ecuador, and Trinidad. Açaí, which contains small amounts of iron, has been traditionally used to help treat anemia. Açaí is a traditional remedy for dysmenorrhea, and there is preliminary evidence that some anthocyanins found in açaí may help with dysmenorrhea symptoms. Roasted, crushed açaí seeds, consumed as tea, are a traditional remedy for fever. Açaí root tea has been used as a traditional remedy for hepatitis. Açaí is reported to be a traditional remedy for diabetes. Açaí juice is a major dietary component of Brazilian diets, especially in the Pará region. It is often eaten at breakfast with cassava meal (manioc) or with tapioca and sugar. The açaí fruit is rich in nutrients and is found in many Brazilian prepared foods. The fruit is most popularly used to make juice, but is also found in ice cream, popsicles, and various desserts. 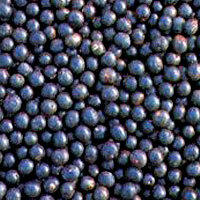 Açaí seeds can be crushed to produce a green oil that has been used as a folk remedy for scrofula (a type of tuberculosis). The roasted, crushed seeds, consumed as tea, are a traditional remedy for fever. Tea made from the root is a folk remedy for jaundice and anemia. Tea made from the grated fruit rind has been used topically as a wash for skin ulcers. Boiled preparations of açaí root have been used traditionally to treat many diseases, including diabetes, hepatitis, malaria, kidney disease, and dysmenorrhea (menstrual pain). No clinical trials of açaí for the prevention or treatment of any health condition have been published in the medical literature.